Nellore Food Festival is an event that took place between 25-May-2007 and 03-Jun-2007 in Hyderabad. There are times in life when you want your food to be really spicy. For us Telugus, that time is every lunch and dinner. These 10 days at Malgudi, then, are just what we live for. Malgudi, the speciality South-Indian restaurant at Road No. 2, Banjara Hills, and at Lifestyle Building, Begumpet, is organising a highly spicy Nellore Food Festival, from 25th May to 3rd June. 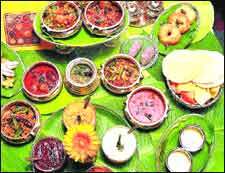 The 10-day festival offers some authentic traditional recipes from Nellore. Jayaramaiah from Nellore will be teaming up with the inhouse executive chef Vijayanand in preparing the exquisite cuisine of Nellore at both the outlets of Malgudi. The menu boasts of Mamidilaya Royyala Iguru, Chintaaku Pakkila Iguru, Kodi Miryalu Vepudu, Munakkaya Mutton Pulusu, Thotakura Pulla Koora, Natukodi Koora, Nellore Chepala Pulusu, Masala Vada Pulusu, Gongoora Chicken, Nellore Biryani and Nellore Minapa Vada. In the deserts, there is the all-time favourite Chandrakala, Neti Ravva Laddu, Sunnundalu, and the Carrot, Beans and Beetroot Halwa. Nellore food is known to be among the most spicy cuisines of Andhra Pradesh. The usage of red hot chillis and black pepper is rampant here. Nellore biryani is different from Hyderabadi biryani as green chillis and more spices are added to it. Poultry and seafood are widely eaten here. The district is the largest producer of shrimps, and so is also called the Shrimp Bowl of Andhra Pradesh. A majority of the produce is exported. The festival is open for both lunch and dinner till 3rd June, and the dishes can be had a la carte. Please contact 6653-2277 or 6454-2195 for further details. Be the first to comment on Nellore Food Festival! Just use the simple form below. fullhyd.com has 700,000+ monthly visits. Tell Hyderabad what you feel about Nellore Food Festival!